No matter what the forecast looks like, dressing in layers will keep you comfortable and safe. Synthetic pants with a tank top or short-sleeved shirt make for a great all-around base layer. Along with it, carry a warmer insulating layer and a rain jacket just in case the weather decides not to cooperate. Sturdy, supportive footwear will protect your feet and ankles from injury, but going overboard with more shoe than you need may result in exhaustion and injury. For most days, light, low-top hiking or running shoes provide support without being too heavy. 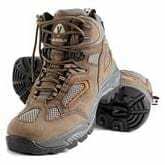 It is tempting to go for bigger boots, but they take longer to break in, and take pack for an overnight trip, you’ll probably be happier in lighter, more flexible shoes. Also, don’t forget quality socks. Wicking, non-cotton socks will help protect against blisters as the miles go by. Even if you only intend to be out for a couple of hours, stashing a few basic items in your pack will keep you happy and comfortable. At least one water bottle and a couple of snacks will keep your energy levels up. A basic first aid kit will come in handy in case of a minor emergency, and a cell phone will come in handy in case of a more major emergency. Use Body Glide’s anti-chafe products when you get dressed. The smaller sizes are perfect for stashing in a pack or purse if you or someone needs protection from sometimes inevitable chafing that comes during a day of hiking – use the balms between toes, on the Achilles, or any spot that rubs. Don’t forget the sunscreen, or you’ll have a very tangible memory of your hike for days to come. Keep a warm hat, a pair of gloves and a headlamp in your pack and you’ll be prepared if you find yourself out after dark or in cold weather. Sunglasses and a sun hat can make all the difference in how a hike feels. A quality pair of sunglasses will protect your eyes from burn and strain, and a wide-brimmed hat makes for even better face and neck protection than sunscreen alone. Trekking poles make a big difference when hiking uneven terrain. They help take the strain off your legs going up and downhill. Binoculars can exponentially increase the experience, particularly if you are a bird watcher or curious about what’s over the next hill. With binoculars, you can see to places you may not be able to reach. Be aware of your fitness level. Choose a trail or walk that fits with your ability. If you’re not hiking with someone else, make sure to tell someone where you’re starting from, where you’ll be hiking, and your final destination. Study where you’re going ahead of time. Pack a map. Be aware of your surroundings as you walk. The more you pay attention to landmarks like buildings, roads, hills and lakes, the less chance you’ll have of getting turned around or lost. Plan ahead and pack everything that you need. Staying safe and comfortable along the trail will help you have an enjoyable outing. The little things can make or break your experience.